He’s the singing Cardinal who uses Facebook to spread the word of the Lord, and he’s now being tipped as a contender to become the first Asian Pope.�Philippine Cardinal Luis Antonio Tagle, Asia’s most prominent Roman Catholic leader, sings on stage, preaches on TV and reduces churchgoers to laughter and tears with his often light-hearted sermons.�With his down-to-earth, personable manner, Tagle, nicknamed ‘Chito’ by his adoring followers, seems a world apart from the conservative Cardinals and Bishops of Europe and North America. His compassion for the poor and unassuming ways have impressed followers in his homeland, Asia’s largest Catholic nation, and church leaders in the Vatican. Despite this his chances of becoming Pontiff are considered remote, as many believe that Latin America or Africa – with their faster growing Catholic flocks – would be more logical choices if the papal electors look beyond Europe.�But even the hint of papal consideration has electrified many in the heavily Catholic Philippines, where past pontiffs had been welcomed by millions with rock-star intensity. ‘It’ll bring such immense glory to us and our country,’ said Leo Matias, one of several waiters at a Chinese restaurant in Manila’s suburban Quezon city who served dinner to Pope John Paul II when he visited in 1995. The talks surrounding Tagle have been fueled by prominent Vatican experts, who see in the boyish-looking cardinal the religious zest, stamina, charisma and communications skills that could energize the church facing crises on many fronts.�John Thavis, a Vatican analyst and author of ‘The Vatican Diaries,’ said the selection of Polish-born John Paul II in 1979 shows the ‘unthinkable’ can occur once the cardinals are closed off in the conclave. 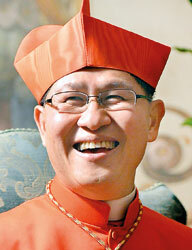 Still, Tagle’s relative youth – at 55, he’s the second youngest among the cardinals – could be a liability. Cardinals could be reluctant to risk giving the reins of the Vatican to someone who could reign for decades. The churchman who last caught the deep adoration of many Filipino Catholics was Cardinal Jaime Sin, who died in 2005. A beloved spiritual leader and moral compass, Sin helped rally multitudes in the massive ‘people power’ revolts that ousted two presidents, including dictator Ferdinand Marcos in 1986.�Sin’s death left a vacuum in the church saddled with the task of shepherding Catholics in a country plagued by poverty, divisions, crimes and long-raging Muslim and Marxist insurgencies. Unlike Sin, Tagle was not propelled by any extraordinary events. But people who know him say that Tagle slowly carved a reputation for simple, day-to-day acts that defined him as a man of deep faith and intellect.�He’s gifted with great communications skills. A wonderful storyteller with a bent for music, Tagle speaks fluent Italian, English and Tagalog. He also has proficient French and can say Mass in Latin. But he prefers to stay in the background.�‘He’s not somebody who sort of wants to, by personality, put himself at the center of the stage,’ Arevalo said. ‘Now, if he’s called to be in front, he has all the capability of doing it.’�Tagle was ordained in 1982 and became bishop in 2001 at an old cathedral, about a block from his family’s home in Imus just south of Manila. Aside from his church work, he taught theology in a hilltop seminary, where he lived for about two decades, staying in a room that had no television or air-conditioning, according to seminary staffers.�Even as a bishop, Tagle did not own a car. He took the bus or ‘jeepney,’ the popular working-class minibus, to church and elsewhere. He ate with workers and sang for a church charity, impressing many with his baritone voice. Tagle stood out for his powerful homilies. A few years ago, he started hosting a Sunday gospel show on TV, where he preached and answered questions. 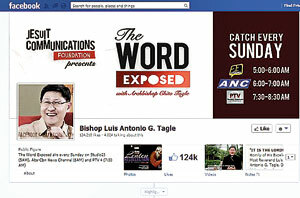 Staffers then opened a Facebook page for him, which has jumped to more than 120,000 followers.�Tagle’s path at some point crossed with the future pope, then-Cardinal Joseph Ratzinger, who introduced him to John Paul II and reportedly assured the pontiff in jest that the Filipino with a youthful face has received his first communion. Ratzinger appointed Tagle as a member of the Vatican’s International Theological Commission, or ITC, and was impressed with his research work and papers. ‘I am sure that it was because of what he saw in him at the ITC that Pope Benedict chose him for Manila and then for the red hat’ of a cardinal, said the Rev. Joseph Komonchak, one of Tagle’s instructors at Catholic University of America. In October 2011, Benedict declared Tagle the new archbishop of Manila, then just a year later, elevated him to cardinal. Tagle tearfully acknowledged in a recent homily in Imus that he was overwhelmed by his rapid rise. ‘It’s unnerving,’ he said.�Larger audiences have turned up to listen to his talks and homilies, where he often raised the need for the Catholic Church to reconnect with people. Almost always, Tagle is mobbed like a movie star by fans jostling to get his picture. VATICAN CITY, March 09, 2013 (AFP) -Vatican workers made final preparations in the Sistine Chapel today after Roman Catholic cardinals voted to begin their conclave to elect a new pope under Michelangelo’s famous frescoes next week.�The conclave of 115 “cardinal electors” will begin on Tuesday to choose the 264th pope, following Benedict XVI’s abrupt decision to resign last month after a troubled eight-year papacy that was often overshadowed by scandals. The 85-year-old Benedict admitted he was becoming too weak in body and mind to keep up with a fast-changing modern world and became only the second head of the Roman Catholic Church ever to resign by choice in its 2,000-year history.�The decision on the date of the conclave was taken on Friday at one of a series of closed-door meetings held by cardinals over the past week to discuss the many challenges facing the next pope. Cardinals seized on the rare chance to air grievances against the Vatican with no new pope to defer to and no old pope to mourn.�Several cardinals have called for greater transparency and a wholesale reform of the Roman Curia, the central governing body of the Church, which has been under a cloud over recent corruption, infighting and intrigue allegations.